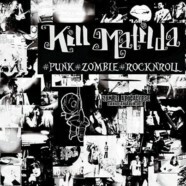 Kill Matilda may be the best punk band you haven’t heard of. Based out of Canada and solely a DIY band, it’s very possible this female-fronted fist full of punk fury has flown under your radar. Not anymore, though. Their latest release, the #Punk#Zombie#RocknRoll EP is a throwback to the classic punk movement with a little bit of horror rock mixed in, serving as an impressive tribute to The Misfits (not that new “Misfits” crap- the real Misfits). The EP opens with “Pomegranate” and a slow, haunting guitar intro that builds up and kicks into a fast-paced punk guitar that rings “Zombie Ball” through and through and will beat you over the back of the head if you aren’t ready for it. From here we go into “I Want Revenge” and lead single “Law Abiding Citizen,” which are your typical punk tracks and show the talent and potential Kill Matilda truly possess. “Geisha Acoustic” is an insanely epic slowdown rendition of “Geisha with a Switchblade” off 2011’s LP I Want Revenge. “Geisha Acoustic” absolutely makes this album what it is and showcases the dark, twisted, fucked up side of drummer Marcus Luk, bassist Mykel Exner and vocalist/guitarist Dusty Exner. In every way imaginable Kill Matilda cross every social line thinkable and, lyrically shows the genius the songwriters truly are. “Geisha Acoustic” is a beautiful, sexual acoustic number that could be taken straight out of a Rob Zombie film and makes the EP shine with the dark intensity the band is truly capable of and shows the gorgeous vocals Exner possesses. It’s placed perfectly on the album too as it comes right before closing track “PBJ,” which finishes the album on another heavy punk level.